Aberdeen's perfect start to the Premiership season continued with a hard-fought victory at Fir Park. 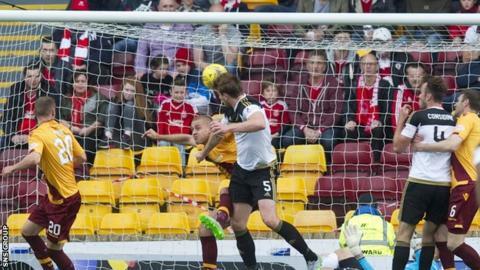 Motherwell, now on a run of three successive defeats, took a fifth-minute lead through Marvin Johnson's shot. However, a cross from Niall McGinn flew straight in to draw Derek McInnes's side level before the break. And defender Ash Taylor headed an emphatic winner from another McGinn delivery to give the Dons nine points from nine. It is the first time since 1991 Aberdeen have won their opening three league matches of the season and last year's runners-up are playing with an air of confidence and authority, a consequence of the winning habit they have developed. This was a big win for them, with Motherwell proving testing opponents in a fabulously entertaining match. Both sides possess players with terrific pace, which added to the absorbing, end-to-end nature of the contest. Indeed, the opening goal owed much to Motherwell's counter-attacking ability. Lionel Ainsworth broke with lightening speed to feed Scott McDonald and the Australian forward's powerful shot was pushed away by Danny Ward. The ball then fell for Johnson, who volleyed into the ground and past the keeper. Aberdeen's equaliser came in bizarre fashion as McGinn curled in a cross from the left and as players from both sides tried and failed to get a touch, the ball crept past the flat-footed Connor Ripley and in off the far post. Both sides contributed hugely to a frenetic game but Aberdeen will feel they deserved the win, having dominated possession and creating more danger for the opposing keeper. David Goodwillie should perhaps have headed them in front just after the interval, but Taylor did exactly that in the 62nd minute. McGinn swept in a free kick from the left and Taylor rose to plant a firm header into the net as Ripley came off his line and failed to get anywhere near the cross. The busy McGinn almost put the game beyond Motherwell with a terrific run and shot, which on this occasion came back off an upright. The high tempo continued in the closing stages but Motherwell could not fashion another opportunity to seriously test Ward as the large visiting support went home delighted. Match ends, Motherwell 1, Aberdeen 2. Second Half ends, Motherwell 1, Aberdeen 2. Substitution, Motherwell. Chris Cadden replaces Jake Taylor. Substitution, Motherwell. David Clarkson replaces Louis Moult. Corner, Aberdeen. Conceded by Louis Laing. Niall McGinn (Aberdeen) hits the right post with a left footed shot from the left side of the box. Attempt saved. Dom Thomas (Motherwell) left footed shot from outside the box is saved in the bottom right corner. Louis Laing (Motherwell) wins a free kick in the defensive half. Attempt missed. Louis Moult (Motherwell) header from the left side of the six yard box misses to the right. Substitution, Aberdeen. Paul Quinn replaces David Goodwillie. Attempt saved. Jonny Hayes (Aberdeen) left footed shot from the right side of the box is saved in the bottom right corner. Louis Laing (Motherwell) wins a free kick in the attacking half. Attempt missed. Lionel Ainsworth (Motherwell) left footed shot from the right side of the box misses to the left. Goal! Motherwell 1, Aberdeen 2. Ash Taylor (Aberdeen) header from the centre of the box to the centre of the goal. Assisted by Niall McGinn with a cross following a set piece situation. Attempt missed. Scott McDonald (Motherwell) header from a difficult angle on the right is close, but misses to the right. Corner, Aberdeen. Conceded by Jake Taylor.